They make me feel wonderful. I slipped them on at Nordstrom, turned to my friend Liz and, striking a pose, said, “Ooooo, I’ve still got it!” And laughed. “Well, at least these jeans make me feel as if ‘I’ve still got it,'” I said, making air quotes around the last part of my sentence. And I laughed again because there’s a story behind that phrase. But first the jeans, then the story. They’re Current Elliot jeans. Not quite flares, but a bit more flared than boot cut. A bit distressed. And fairly high waisted. Yah! No more low rise for me. Ever again. I also like my new jeans with this blue and white striped, rayon and linen, long sleeved tee shirt from Alexander Wang, which I may have picked up the same day I didn’t intend to buy the jeans. It’s tissue thin, and will be good under my winter coats. Like the brown Max Mara I’m wearing here. Or as a layering piece. Or on those frosty winter days when I want to be super casual, I can wear my new jeans with this long, loose Vince turtleneck. 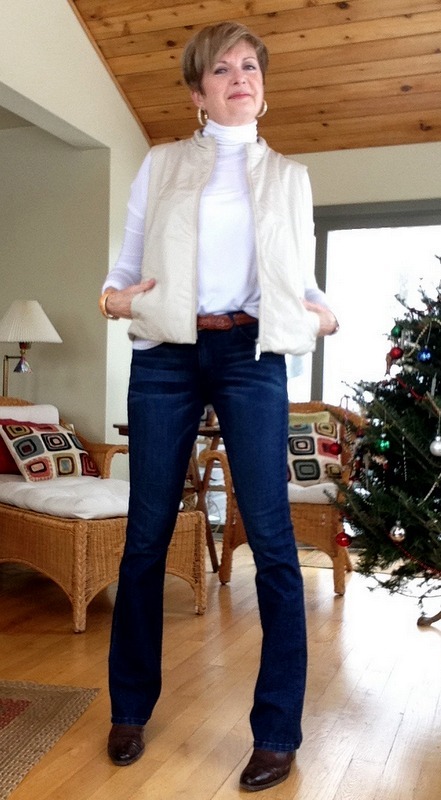 And my old cream Max Mara puffa vest. I bought it in 2002 with a winter white, corduroy, midi-skirt to match. The skirt’s long gone, but I still love the vest. Max Mara makes quality stuff. This would be a great outfit for a winter road trip. Say, to the Laurentians for a few days of skiing at the end of January… if Hubby’s shoulder continues to improve. Fingers are crossed. I’m trying the half-tuck thing here, with the jeans belted. The jury’s still out on this, though. Feels kind of contrived. But fully tucked in is not an option. I lost the right (and the desire) to tuck when middle-age middle made its appearance a few years ago. Now about that story. A few years ago when Hubby and I were both still working we liked to get away for a couple of cross-country ski weekends each winter. We’d book into a small motel somewhere up the Ottawa Valley, or near Algonquin Park, and ski the groomed trails, if there were ski trails; if not we’d ski the snowmobile trails, sometimes even breaking trail on old woods roads that were used for logging in the summer. One weekend we’d booked into a little inn somewhere south of Algonquin Park, skied the snowmobile trails all day, and on Saturday night were eating supper in the bar/restaurant. More bar than restaurant, actually. While we were eating the place filled up. The parking lot and the snow covered back yard of the inn filled with roaring snowmobiles, and the bar filled with people clad in full body snowmobile suits, and heavy boots, carrying their helmets in one hand and a beer in the other. It was darts night, the waiter told us. “Where’re ya goin’ blondie?” he winked, and when he grinned again, I could see that he was missing several teeth. “Over there,” I pointed to the door. “Are ya sleddin ta-night?” he gestured with his beer and spilled some. “Ah well, that’sh too bad,” he said. “Yep. See ya,” I sidled past him. Ah well. I may be almost sixty, now. But when I pull on my new Current Elliot jeans… well, I feel like I’ve still got it. Kind of. Sort of. Whatever “it” might be. Ha. Thanks, DA. He was pretty cute, too…well except for the teeth and the fact that he was about as old as some of my students. You look fabluous…would never believe you were almost 60. Good luck with the knitting – tend to keep my knitting projects to small items only for exactly the same reason. Thanks, Amy. Good idea about small knitting projects. This was supposed to be a quick one, it's just that the yarn is very hard to work with. Once it's done… no more mohair/silk yarn for me! Thanks, Judy. Good luck at Nordstrom…and with your husband's surgery. Thanks, Patti. Once past a certain age…it doesn't matter where the "compliment" comes from. And you DO still have it! 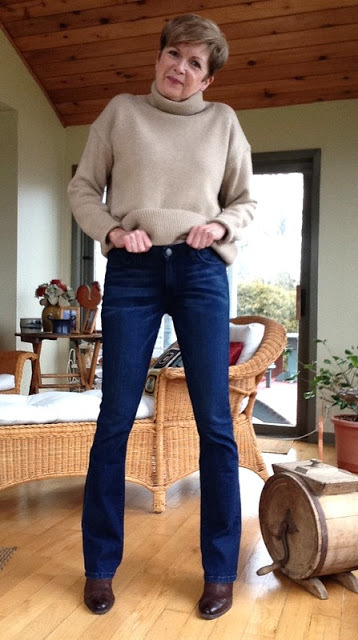 Great post- and great jeans! Love the scarf – what is the pattern please? Oh, and Happy New Year! You might be happier working that with wooden needles which would have a bit more grab…although given that you're working with two sizes of needles, that would add a bit too much to the cost of the project . . . Thanks, Riley. The camel sweater is very warm. But not warm enough for the -15 Celsius today. So I wear it under a light coat. It's too hot under my down coat. If you meant the tee shirt… it's perfect under a winter coat. Especially for winter shopping when I'm in and out of malls which can be hard to dress for. Cold/hot/cold etc etc. Jeans look fabulous on you – think I'll have to check out Elliot jeans quite soon ! Thanks, Monica. I'd never tried Current Elliot before…but I'm loving these ones. Thanks, Marea. Yep… that story always makes me laugh. Gorgeous!!!! You are definitely rocking those jeans….hubby had better carry a big stick, to ward off all those men! Keep trying the half-tuck, it is a good look….I have started the half-tuck closer to one hip, and it has worked quite well, though I didn't have a vest on top. Have to say, the only thing I'm rocking, is the pickleball (tennis) skirts! Love your post! 🙂 I LOVE your new jeans. You look absolutely fabulous in them ! Thanks, Frances. Feels so good to not feel your pants coming down all the time. And thanks for the knitting advice. I've never used that type of yarn before…plain old Lopi wool seems sooo easy in comparison! Thanks, Arlene. It's frustrating knitting that way, knitting from the smaller needle back onto the big one whit yard that doesn't really stretch… argggg. Hope you are having a good start back at school this week. Thinking of all you guys yesterday when I didn't have to go anywhere in -25 temps. We sure do…come on out (the powder is great this winter)!! Thanks, Libby. Can't think of anything that makes me feel better than a great pair of jeans… clothes-wise, of course. Yep Susan, you definitely have still got it! 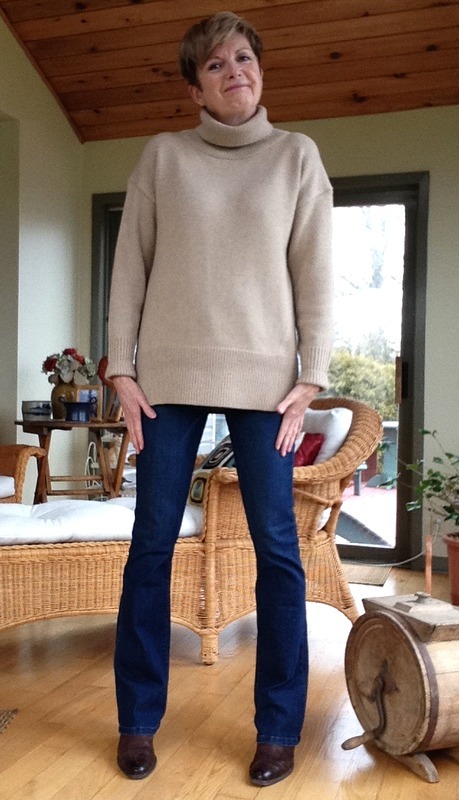 To me, all jean wearing is not created equal…jeans can be dressed up or dressed down depending on how you wear them. I love all your combinations and the cut of the jeans is perfect for your boots. 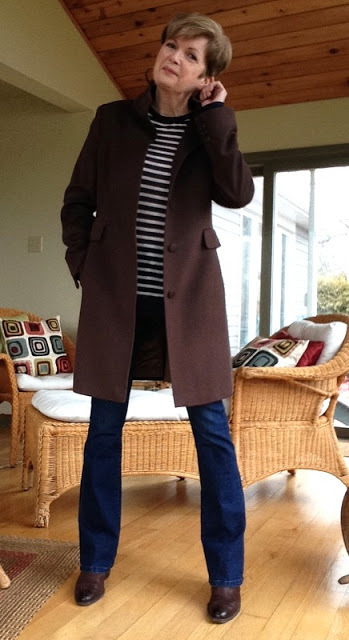 Thanks for sharing your fashion flair for the My Refined Style Linkup!